Did you know that the custom of kissing under mistletoe comes from England? The original idea was that a berry was to be picked from a sprig of mistletoe before the person could be kissed. So when all the berries had gone, there could be no more kissing! I have always loved the notion of hanging up mistletoe, but they dry out so fast and then lose their color and charm. 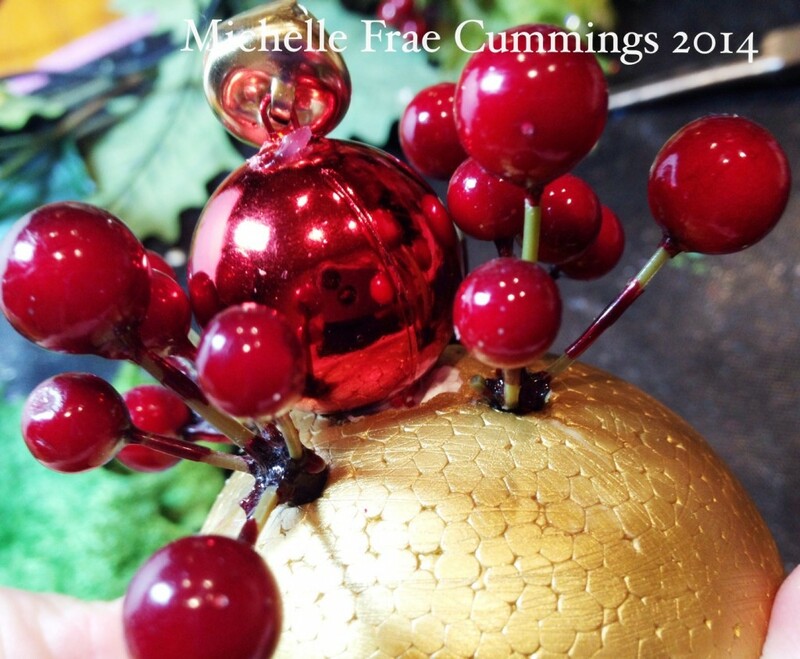 So I dreamed up this little beauty and I hope you’ll be inspired to make one for yourself – Merry Christmas! 1. Fold the red wire in half and string the bell at the end in the fold. 2. Pinch the wire ends together and string through the red ornament. 3. Paint the Smoothfoam ball bright gold and let dry. Pierce a hole all the way through with a skewer. 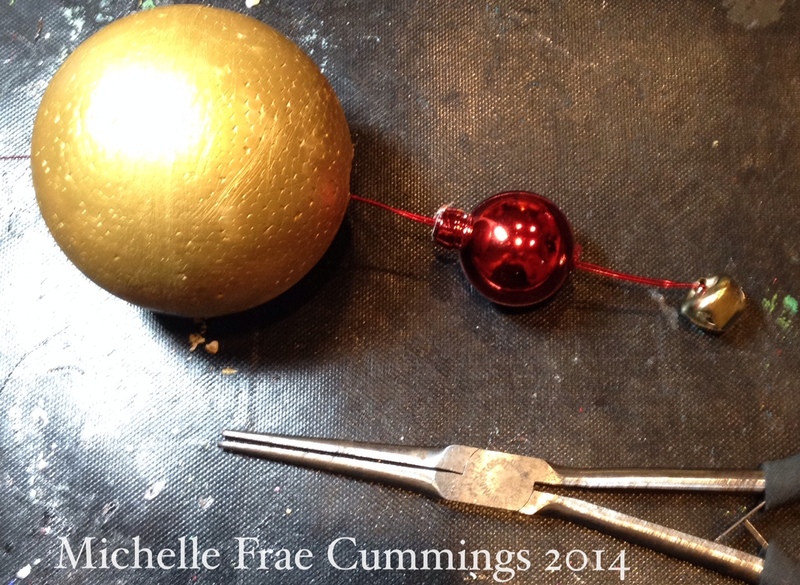 Use the pliers to widen the hole and add some glue inside, then pull the wire out the other side so the tip of the red ornament fits snugly inside the ball. 4. Poke holes into the bottom of the Smoothfoam ball with the skewer or pliers. Add glue and push in the holly berry stems. 5. While the glue sets, arrange your leaves in the desired order. Thread your wire through the red button and glue the button to the top of the ball. When the glue has set, twist the wire and make a loop. Trim off any excess wire. 6. Starting from the bottom of the ornament, glue on your darkest leaves first and use a pin to hold each in place while they dry. 7. 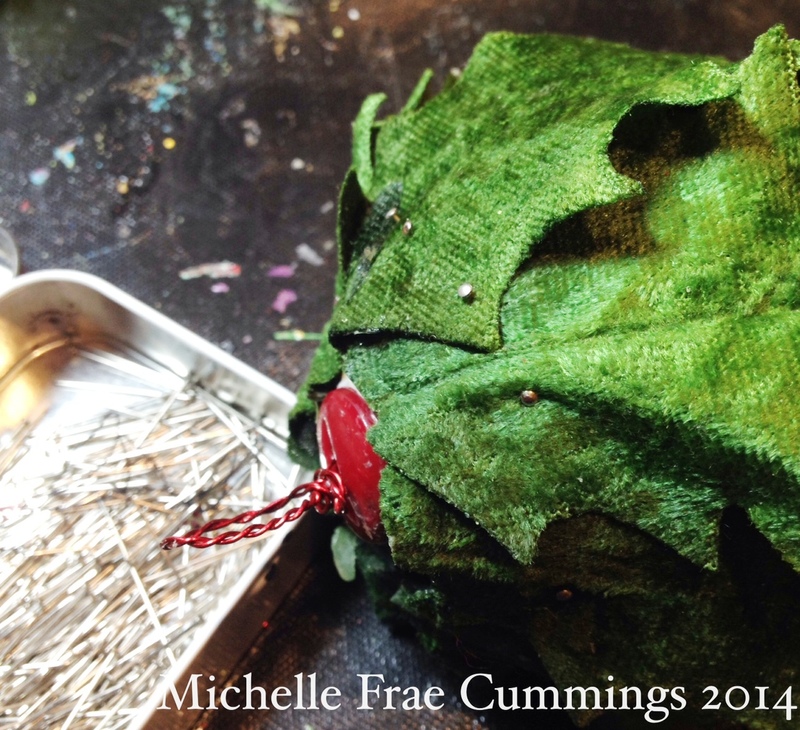 Continue gluing on more leaves until the ball is covered. When the glue is dry, you can remove the pins and glue rhinestones on the leaves to accent. 8. Apply lines of glitter glue along the veins of the leaves. 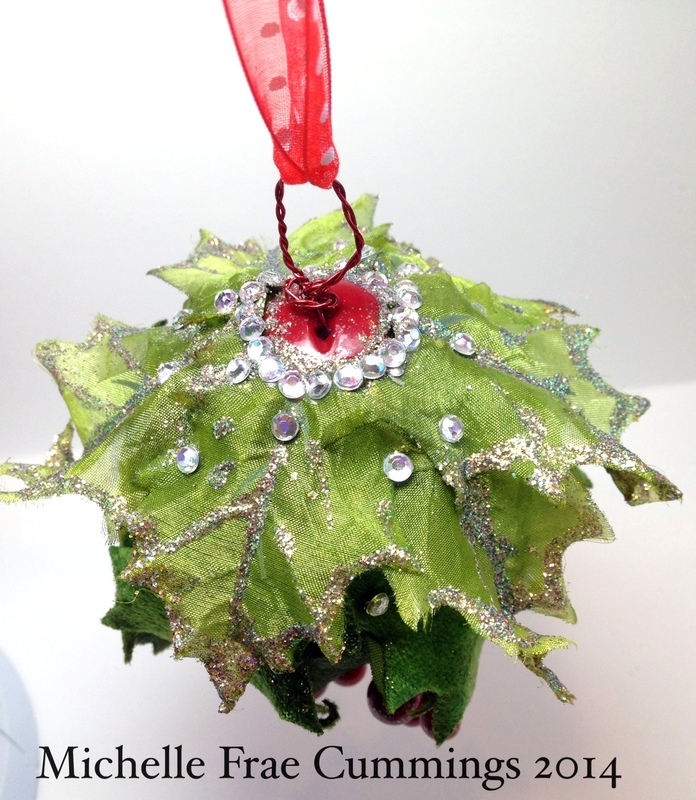 Add some glitter glue around the button and let it dry completely before hanging your ornament with the red ribbon. 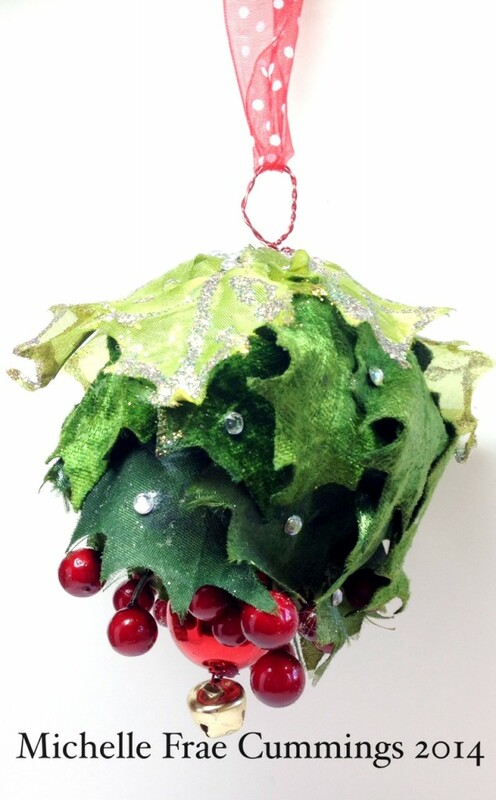 This entry was posted in Holiday Crafts and tagged Ball, Christmas, Green, Holiday Ball, Ornaments by Michelle Frae Cummings. Bookmark the permalink.